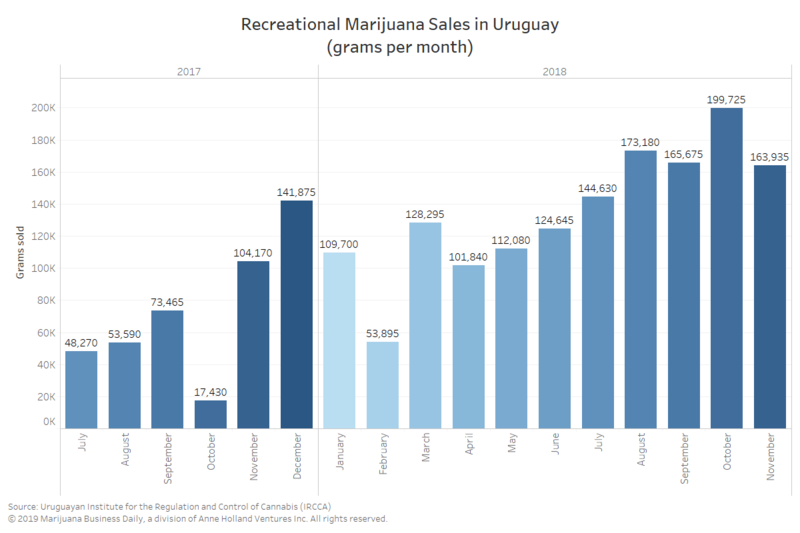 Despite supply challenges that have limited patient access, Uruguay has diverted roughly $22 million of cannabis sales away from the illicit sector and into the regulated market, according to a recent report by the country’s cannabis regulatory agency. Home growing, which started in 2014. Cannabis clubs, which started in 2015. Pharmacies, which started July 19, 2017. The black market stopped receiving $22 million, and the government estimates that 68% of that corresponds to registered users who legally grow at home, 20% who are members of cannabis clubs and 12% from sales in pharmacies. Supply issues have consistently hindered implementation of the law, leading to a new application process launched Monday to increase the number of producing companies. 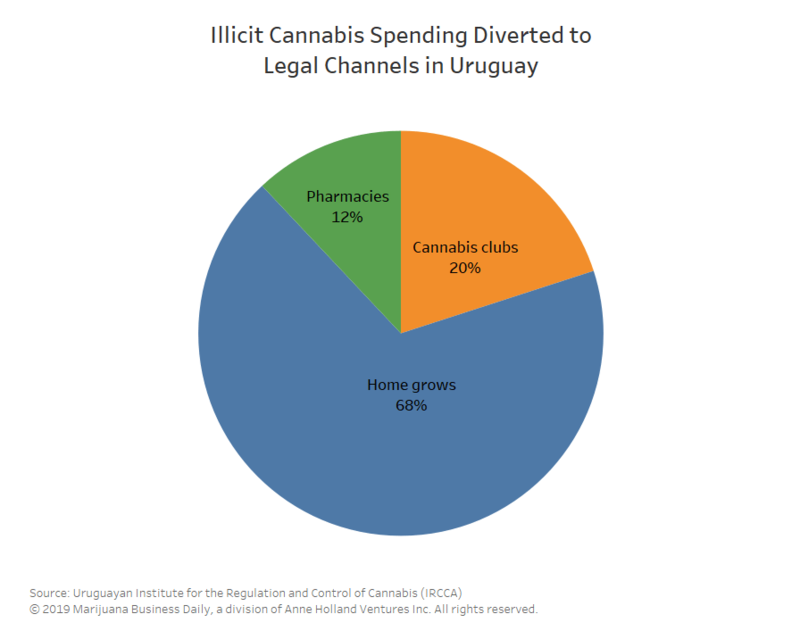 So far, only two companies have been granted licenses to grow and sell recreational marijuana to authorized pharmacies, the only retail locations where cannabis can be purchased in Uruguay: ICC Labs, which was recently acquired by Canada’s Aurora Cannabis, and Symbiosis. Pharmacies sold a total of 1,916 kilograms (4,224 pounds) in the first 500 days sales were allowed, an average of 3.8 kilograms a day. Total sales in pharmacies amounted to $2.6 million, of which the two producing companies received roughly $1.8 million – just over $100,000 a month each. The remainder went to the pharmacies and the government. Under the new process, three additional companies will be selected to cultivate recreational marijuana. Each of the winners will sign a contract with the government to supply 2,000 kilograms a year for five years. Companies not selected will be placed on a waiting list that the government could use for up to three years if it decides to further expand production. “The present situation hinders the adequate development of the system and its favorable consequences (such as the reduction of illegal access to cannabis, the progressive expansion of the use of controlled products in their quality and safety, or the changes toward consumption practices of lower risk for the health of the users),” according to a statement released by the Institute for the Regulation and Control of Cannabis (IRCCA), the Uruguayan cannabis regulatory agency. While the government agency considers the diversion of sales from the illicit market a success, challenges remain for retail pharmacies. 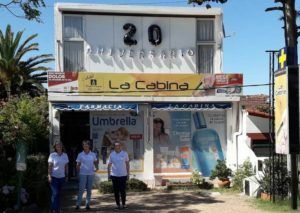 Marijuana Business Daily spoke with Alicia Chavert, owner of La Cabina, one of the only 17 pharmacies where cannabis is legally sold in Uruguay, about the process. 1. Production has been – and still is – the biggest bottleneck. 2. Geographical coverage has been the second bottleneck. “I have clients that drive 200 kilometers to buy cannabis, because they have no other legal options nearby,” she said. “I have many times more cannabis clients than the total people who live in this town. 3. With advertising prohibited, pharmacies have had to develop communication workarounds. While pharmacies can’t advertise to let their customers know that they have cannabis available, La Cabina created a system using social media to communicate with its clientele. To let buyers know that there’s product available, the pharmacy changes its Facebook profile picture to green, then to yellow when only a few packages are left, and then it remains red most of the week. “Otherwise, I’d need to hire a marijuana telephonist,” Chavert said. 4. Focus on building compliance and trust. 5. Tourists can’t buy, but they can learn – and share what they’ve learned about the business structure. “That only residents are allowed to buy doesn’t mean that tourists can’t learn how this works,” Chavert said. “Some just come and want to see the packaging. It blows their mind. As the legal system continues to grow, Chavert said that acceptance of the good such a program can do for communities has also grown. 7. Customers are thankful for safe supply – even if it is constrained by lack of producers. There are only two plain-packaged chemovars (plant variants with distinct chemical compositions) available for adult residents – and those are capped at 9% THC.